In general, an expert said, people who have not been itemizing their deductions will probably fare better under the new law, which features an increased standard deduction. With the $1.5 trillion Republican tax bill nearing passage in Washington, change appears certain for taxpayers nationwide — and some experts are already suggesting tips that might save people money. James Angelini, an associate professor of accounting and taxation at Suffolk University, said there is no perfect “one size fits all” advice for taxpayers. “You’ve got to take a look at last year’s return and recalculate it under the new rules and see what happens,” he said. In general, he said, people who have not been itemizing their deductions will probably fare better under the new law, which features an increased standard deduction. 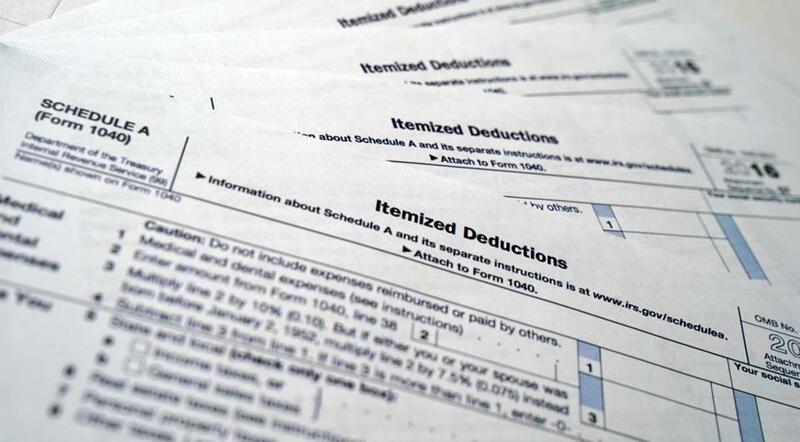 “If you didn’t file Schedule A [itemized deductions] last year, you’re going to make out. Your taxes are probably going to go down,” he said. For those who do itemize, it’s “quite complex . . . it’s brutal,” he said, noting a laundry list of changes in the federal tax law that could affect itemizers in a variety of ways. “We’ll be dealing with this for years,” he said. Here are some of the possible tax tips, mostly for current itemizers, that are being discussed by experts. A Massachusetts Department of Revenue official didn’t immediately have a comment on whether and how much prepayment would be allowed. John Laurito, chief executive of Concord Wealth Management in Waltham, said he’s seen people in the past pay the first quarter of the next year’s taxes before the current year’s end. He said people should make sure to check with their banks if the banks are paying property tax bills through escrow accounts. ■ Prepay your estimated state income tax. People who make quarterly state income tax payments could make their fourth-quarter payments for 2017 before year’s end, even though the bills aren’t due until early 2018. That way people can deduct that payment from their 2017 taxes. ■ Increase charitable donations. Under the new law, many people are expected to stop itemizing deductions in 2018 because of the increase in the standard deduction. In that case, any charitable giving people do in 2018 wouldn’t be deductible. However, charitable contributions in 2017 still will be, so giving early, before the year ends, could give people a tax break they won’t be using next year. ■ Make an early mortgage payment. People who are no longer going to itemize in 2018 might consider making in December the mortgage payment for January and deducting the interest on that bill from their 2017 taxes, the Detroit Free Press reported. ■ Pay down home equity loans. Again, as with making an early mortgage payment, people might consider making their January home equity payment in December so they can get a deduction for the interest in 2017, the Free Press reported. Home equity loan interest deductions are being eliminated in 2018, the Globe reported. ■ Postpone earnings. If you’re among the lucky taxpayers who will find themselves in a lower tax bracket next year, push your earnings into the next year so they can be taxed at the lower rate. Workers can ask for bonuses to arrive in 2018, contractors can ask for payments to be delayed until then, and small business owners can push their own income payouts until then, CBS reported. The strategy also applies for anyone who had a very big earnings year, Laurito said.